The Kidney Walk is done for another year. Thank you. It was a beautiful blue-sky kind of Sunday for this year’s edition of the Kidney Foundation‘s annual Kidney Walk in London, Ontario. As fundraisers go, it was quite a success, raising in excess of $38,000 for the Foundation. 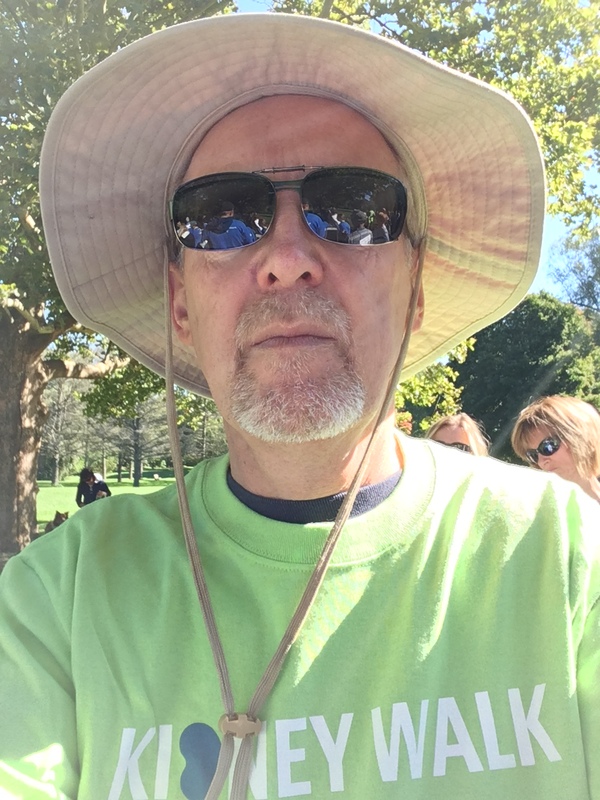 On an individual level, you, my sponsors, combined to put my walk first among individual fundraisers, raising $2,360. Thank you very much for your support for me and for this cause. I am not a selfie pro. I cannot take a picture of myself and smile at the same time! The green shirt indicates a “champion,” with over $1000 raised. Not everyone with kidney disease (or a transplant) is an old geezer like me. Among the folks I saw today was a family who were walking on behalf of their little son, who appeared to be all of 4 years old. Kidney Disease is a generic term because it can arise from a variety of causes and at a variety of ages. One young man of 34 spoke of his disease as having been genetic, inherited. The disease I was diagnosed with at 25 has its own distinct story. Whether known or unknown, I am grateful for the support of people like you, which helps advance patient care and medical research. Thank you. This entry was posted in Uncategorized and tagged altruism, dialysis, kidney disease, kidney donation, kidney for russ, Kidney Foundation of Canada, Kidney Walk, kidneyforruss, kidneywalkcanada, London Health Sciences Centre, London ON, Membranoproliferative Glomerulonephritis, Ontario, organ donation, organs, Russ Sawatsky, University Hospital on September 23, 2018 by kidneyforruss. I learned something new today. I was speaking with the coordinator of the Multi-Organ Transplant Program here at the London Health Sciences Centre. We talked about what it means to be on the deceased donor list, the possibilities of the Living Donor Paired Exchange program, and my physical capacity to accept a transplanted organ without rejection. Except in the case of identical twins, every organ recipient needs to take anti-rejection drugs following a kidney transplant. I knew already that as someone with Type O blood, I need to have a Type O donor. What I wasn’t fully aware of before was that different individuals have different levels of immune sensitivity. Usually, heightened sensitivity, or a “revved up immune system,” is the result of a previous organ transplant, a blood transfusion, or pregnancy. The last one is ruled out, clearly, and to my knowledge I’ve never had a blood transfusion or other organ transplant, so it’s not clear why my immune system is the way it is, except that I have been told that my kidney disease, membranoproliferative glomerulonephritis, is itself a result of the immune system going wrong and attacking my kidneys. No one has drawn that connection for me, yet, though. So, how revved up is my immune system? The way it was described to me was as follows: If I have ten potentially compatible donors and my immune sensitivity is such that I could accept a kidney from all ten, then I have an immune sensitivity of 0%. If on the other hand, there was a high likelihood of rejection from all ten, my immune sensitivity would be 100%. Mine happens to be 53%, more or less in the middle. What does that mean? It means that it might be a little more difficult for me to get a donated kidney than I had previously thought, resulting in more time on the waiting list and more time on dialysis. It also emphasizes the value of people signing up online as organ donors. In Ontario, go to https://beadonor.ca/. 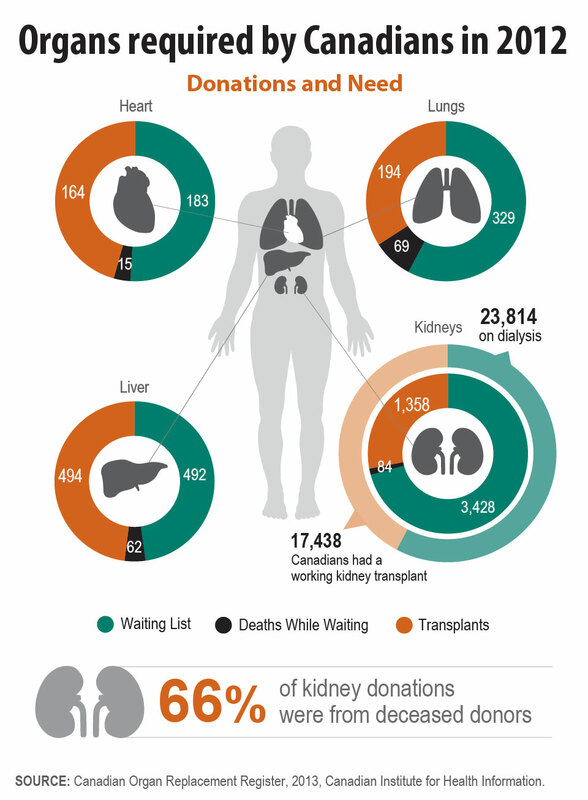 I’ll close with a graphic showing the situation for those needing donated organs in 2012. It’s a bit dated, but the situation is not markedly different. This entry was posted in Uncategorized and tagged dialysis, how do I donate an organ?, How do I save a life?, kidney disease, kidney donation, kidney for russ, kidneyforruss, Membranoproliferative Glomerulonephritis, Ontario, organ donation, organs, Russ Sawatsky on February 18, 2015 by kidneyforruss. 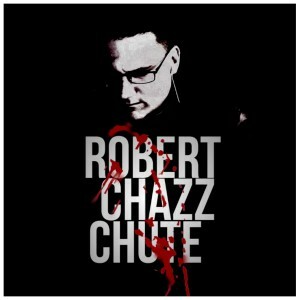 My good friend and neighbour, Robert Chazz Chute, is a prolific author who also hosts the Cool People Podcast. Last weekend, he had me over to his place for a chat that has now been posted on his podcast website, http://coolpeoplepodcast.com/. We discuss religion, Good and Evil, God, restorative justice, human behaviour and my life with kidney disease. Have a listen. You can go to the website or search for Cool People Podcast on your podcast app. Check out a couple of his other websites as well: http://chazzwrites.com/, and http://allthatchazz.com/. This entry was posted in Uncategorized and tagged altruism, British Columbia, Christianity, Cool People Podcast, Culture and organ donation, dialysis, ethics of organ donation, ethics of organ transplantation, Good and Evil, how do I donate an organ?, How do I save a life?, Human Behavior, kidney disease, kidney donation, kidney for russ, kidneyforruss, Membranoproliferative Glomerulonephritis, Ontario, organ donation, organs, peritoneal dialysis, podcast, Religion, Religion and organ donation, Restorative Justice, Robert Chazz Chute, Russ Sawatsky on January 5, 2015 by kidneyforruss. Kidney disease affects people of all ages. Here is a series of three online news articles about a 13-year-old girl from Michigan who was diagnosed with a rare, possibly unique, combination of kidney diseases, a year-and-a-half ago. Her story was published in the Monroe News last spring, written by Caitlin VanOverberghe. LaSALLE — There are purple, glittery curtains hanging in the window of Julia DePelsmaeker’s bedroom. The bedspread that covers her mattress is patterned with pink and purple swirls, and stuffed animals line the foot of the bed. Her walls are covered in colorful draw­ings. Her shelves are full of little knick­knacks and framed photos. It’s exactly the bedroom any 13-year-­old girl would dream of — except for one thing. In the corner near the door is a machine. It’s large, but quiet, with cords stretching out in all directions. Above the machine, next to a large and colorful picture of a butterfly, there are poster-sized instruc­tions detailing how to use the device care­fully and safely. Just by looking at her, it’s nearly impos­sible to tell that Julia is sick. It’s not until she reveals the dialysis catheter protrud­ing from her abdomen that the secret of her disease is exposed. A year ago, Julia was diagnosed with four rare kidney diseases — nephritis, ne­phrotic syndrome, membranoproliferative glomerulonephritis and IgA nephropathy. She’s the only person in world to have this particular combination of illnesses. Only two similar patients ever have been documented. Julia DePelsmaeker, the 13-year-old Monroe Middle School student living with four rare kidney diseases, under­went a successful transplant surgery Friday afternoon. Annette DePelsmaeker, Julia’s mother, said the family, includ­ing Julia’s living donor Chris Shields, 25, of Erie, was admit­ted to the Mott Children’s Hos­pital late Thursday evening in preparation for the surgery. Mrs. DePelsmaeker said Julia was in good spirits all morning prior to surgery and even got a chance to see her new kidney before doctors began the pro­cedure, after they had removed it from Chris. The surgery lasted about three hours and Julia was placed in intensive care after­ward, which doctors expected. She’ll remain in intensive care for the next few days and won’t return home from the hospital for another two weeks. Chris’s surgery took several hours as well, but he was up and moving around not long after, his wife Deanna (DePels­maeker) Shields said, and was immediately asking about Julia and how she was doing. Chris is expected to be re­leased from the hospital some­time Saturday. 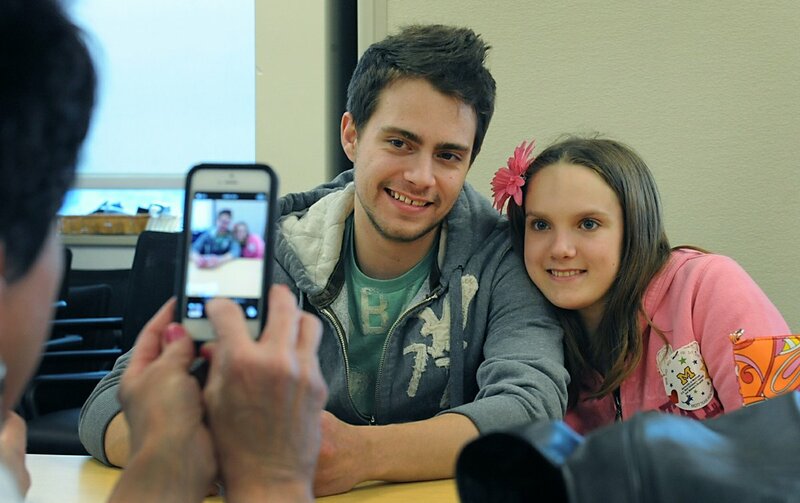 Chris Shields, who donated his kidney, and recipient Julia DePelsmaeker, 13. Julia DePelsmaeker, 13, returned to her LaSalle home Monday night after spending 10 days in C.S. Mott Children’s Hospital, Ann Arbor. Julia had been living with four rare kidney diseases before undergoing a transplant on May 2. While in recovery, Julia experienced few issues, Annette DePelsmaeker, Julia’s mother, said. One doctor even went as far as to say that “Julia has had the best recovery out of all the transplant patients she’s treated,” Mrs DePelsmaeker said. “(The doctor) was impressed at how Julia does exactly what they ask of her and doesn’t complain,” she continued. Chris Shields of Erie, Julia’s living donor, was released within 24 hours of the surgery. The DePelsmaekers will continue to make routine trips to Mott for the next few weeks so that Julia’s progress can be monitored. With the exception of those hospital trips, Julia will have to remain at home for two months. While she cannot return the Monroe Middle School for daily classes, Julia will be able to video call her teachers and classmates during the day. Julia DePelsmaeker’s family will host a spaghetti dinner Saturday to help pay for the costs of the kidney transplant, both for her and donor Chris Shields. The dinner will be served from 2 to 7 p.m. at Local 723, United Auto Work­ers, hall, 281 Detroit Ave. Pasta, salad, rolls and desserts will be available from Dena’s Kitchen. There also will be raffles, a silent auction and a DJ. “At first we just thought it would be a pre-transplant party with some of our closest friends,” Debbie DePelsmaeker, Julia’s aunt, said. “But it has grown quickly. We’re planning on hundreds of people coming.” Debbie, who is leading the fundraiser, said the money will go to help pay surgery expenses for Julia and Mr. Shields, to help him make ends meet while he is away from work and to set up a college fund for Julia. Additionally, students at Monroe Middle School are holding a spirit week in Julia’s honor this week. Students can pay $1 a day to participate in dress-up days such as pajama day, decades day and green-for-life day. This entry was posted in Uncategorized and tagged altruism, Culture and organ donation, dialysis, health insurance, how do I donate an organ?, How do I save a life?, kidney disease, kidney donation, kidney for russ, kidneyforruss, Membranoproliferative Glomerulonephritis, organ donation, organs, peritoneal dialysis on November 22, 2014 by kidneyforruss. The following information is taken from the Kidney Foundation of Canada website. Every cause mentioned is linked to the appropriate page on the website if you are interested in knowing more. Alport Syndrome (AS) is an inherited disorder of the basement membranes of the kidney, eye and ear. People who inherit defective genes for the “collagen” proteins in these basement membranes may develop progressive loss of renal function, deafness and abnormalities of the eye. Diabetes is a disease that is caused by the lack of insulin in the body or the body’s inability to properly use normal amounts of insulin. Infections: the urine of diabetics has a high sugar content, which encourages the growth of bacteria; consequently kidney infections may occur. Nephrotic syndrome is also called nephrosis. These two terms describe a condition in which the kidneys leak large and abnormal amounts of protein into the urine. When protein is lost in the urine, this leads to puffiness or swelling (edema), often of the eyelids, feet and ankles, and eventually the abdomen. If left untreated, this can lead to problems with breathing, eating and infections. Most children respond very well to treatment of nephrotic syndrome and, although most children have further attacks of the disease, the long-term prognosis for most children is very good. Childhood nephrotic syndrome can start at any age, but usually begins between the ages of two and five years. It is a rare condition that affects about 16 out of every 100,000 children at any given time, and it affects more boys than girls. The exact cause of nephrotic syndrome is not known and it cannot be prevented. However, research into this condition is ongoing and researchers are trying to develop increasingly effective treatments. What we do know is that nephrotic syndrome is usually caused by an imbalance, from time to time, of the body’s immune system. This imbalance causes certain chemicals to disturb the filters of the kidneys. These filters begin to allow proteins to leak into the urine. The disease I have. To be specific: membranoproliferative glomerulonephritis type 1. Glomerulonephritis, also called GN or nephritis, is a disease of the kidneys in which the glomeruli, the tiny filters in the kidneys that help to clean the blood, become inflamed or damaged. This allows protein and red blood cells that normally circulate in the bloodstream to pass into the urine. Glomerulonephritis has many different causes. In the majority of cases, the cause is unknown. However, the number of known causes has increased in recent years. It has been recognized for some time that certain infections, drugs, and – in rare cases – even cancer can lead to GN. More recently, it has been discovered that many different abnormalities in the genes of the body can also lead to the development of glomerulonephritis. However, GN is not commonly inherited (passed on genetically from parent to child). The majority of cases of glomerulonephritis are sporadic; this means the disease arises spontaneously. There is some evidence that GN may be caused or made worse by a problem in the body’s immune system. Hemolytic Uremic Syndrome (HUS), commonly referred to as “Hamburger Disease”, is a disease that affects the kidneys and other organs. It poses a substantial threat to Canadian children as one of the leading causes of both acute and chronic kidney failure. HUS is more commonly seen in the warmer months of the year, following a gastrointestinal illness caused primarily by a particular strain of bacteria known as E.coli 0157:H7. While other types of E.coli are commonly found in the gastrointestinal tract of healthy humans, this particular strain (0157:H7) is not usually present except in diarrheal illnesses. Kidney disease can lead to high blood pressure in many people. The opposite is also true: having high blood pressure increases the risk of developing kidney disease. High blood pressure can damage the kidneys. This reduces the kidneys’ ability to remove fluids and waste products from the blood, and can lead to kidney failure. Kidney stones do not commonly lead to kidney failure. Polycystic means “many fluid-filled sacs” or “many cysts”. Polycystic kidney disease (PKD) is a genetic disorder that causes multiple cysts to form in the kidneys. PKD is an inherited disease. Lupus Erythematosus (LE) is a disorder that may involve only the skin (cutaneous LE), or it may involve many parts of the body, including the kidneys (systemic LE, also known as SLE). Kidney involvement is significant in SLE, but not all patients suffer from it. The extent to which the kidneys are affected by SLE is variable and involvement may also change over time. Kidney involvement is not always serious. Only one in five cases is severe. This entry was posted in Uncategorized and tagged causes of kidney disease, kidney disease, kidney donation, kidney for russ, kidneyforruss, Membranoproliferative Glomerulonephritis, organs on October 28, 2014 by kidneyforruss. Many of my friends are aware that I have been living with kidney disease (Membranoproliferative Glomerulonephritis, Type I) for a number of years. A milestone of sorts has arrived, though, so I thought it about time to bring everyone up to date. Earlier this year, my nephrologist came to the conclusion that I would need to go onto dialysis as my kidney function had been deteriorating at a fairly fast pace recently. In advance of that need, on July 18 I underwent a procedure to insert a catheter into my abdomen to the right of my belly button. This catheter facilitates my preferred choice of dialysis, which is called peritoneal dialysis (PD). The peritoneum is a lining of the abdominal cavity, but as used in PD serves as an effective filter for drawing wastes from one’s body. I completed a week of training on the PD cycler machine on September 12. I now have this machine beside my bed to which is connected two five-litre bags of sugary fluid. I hook up that machine to the catheter and while I sleep, it pumps this fluid into my belly, lets it dwell there for a while, drains it out and pumps some more fluid in over several cycles, and effectively removes the waste from my blood, performing the function that my kidneys are no longer adequate to handle. 1. PD means I can lead a more or less normal daytime life, albeit with some time devoted each day to the setup and cleanup of the equipment. Having said that, I have not yet had a normal night’s sleep since I started. 2. PD is done daily rather than 3 times a week in the clinic version of hemodialysis, so my blood is cleaner. 3. My diet is not as restricted on PD vs. hemodialysis. 4. The machine can be packed in a carry-on case to take on an airplane or in a car, and the supplier of the fluid and related equipment, Baxter, can also ship it anywhere in the world, so travel remains a possibility even after beginning PD. Despite all that, I find the reality of daily dialysis somewhat daunting. I’m literally confined by a tether of several feet for a solid eight hours. But, at least I have this option until a possible kidney transplant comes along. And given that the doctors said 30 years ago that I had 10-15 years before my kidneys would fail, I’ve done pretty well, and for that I am grateful. This entry was posted in Uncategorized and tagged kidney disease, Membranoproliferative Glomerulonephritis, peritoneal dialysis on October 3, 2014 by kidneyforruss.